Question: I recently installed RHEL 7.2 and.. the icons on the desktop are HUGE. How can I decrease their size? change the way of displayed icons to icon view NOT detailed view! While zooming the icon view the icons are changed on the desktop at the same time. Zooming is not reflected while using detailed view! Edit: If you're on a laptop without scroll wheel, use Ctrl + +, or Ctrl + -, to increase or decrease icon size. Download the version of Nautilus that you are currently using from the Nautilus snapshots website. To find that out, run nautilus --version from the terminal. After downloading the archive, unzip it to whatever directory you want to work from. 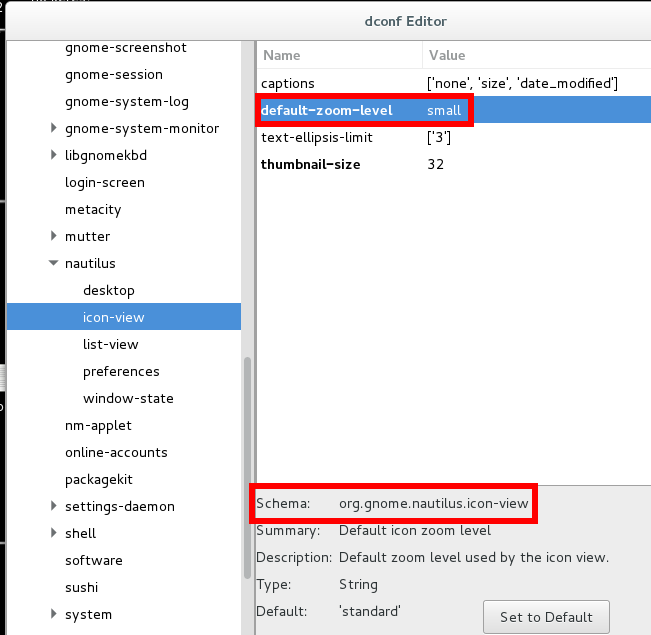 From within the unzipped package, open the file nautilus-icon-info.h. Within the first several lines you will see various sizes designated for the particular scroll-setting options. For instance, within the file for version 3.20.4 the icon sizes start on line 36. Change each of those levels to whatever you want to use so that you can make the icons much smaller (or larger). After editing and saving the file, it's time to configure, compile, and install. Run the following commands from the terminal from within the base directory of the version of nautilus that you have downloaded and unzipped. Make sure that you are within the base of the folder structure of the nautilus directories! This can be run altogether with the command ./configure && make && make install. If the ./configure command fails, it's because you are missing some other dependencies. I apologize if my list of dependencies above was incomplete. Google (or whatever search engine you want) to find what package it is that you need. You can use Synaptic to search for what you need if you're unsure even after Googling. Once installed, I suggest a reboot just to make sure that every single thing is reloaded properly. You can now tweak with your icon sizes as you wish. Not the answer you're looking for? Browse other questions tagged gnome-shell icons or ask your own question.